It’s a good time to be a fan of scoundrels and Wookiees. Yesterday saw the release of the official trailer for Solo: A Star Wars Story, and we now have our first look at a galaxy of toys, action figures, games and more products based on the highly-anticipated film — with many already available for pre-order at retailers across the US, including Walmart, Amazon, and shopDisney.com. Ranging from incredible LEGO setsl like the Kessel Run Millennium Falcon to beautiful Star Wars: The Black Series figures (we need that Lando! ), products will hit stores beginning this Friday, April 13, and continue rolling out through May at mass retailers, Disney Store, shopDisney.com, and Disney Parks. Check out a bunch of new items below, along with official descriptions and packaging art. Punch it! Set off at lightspeed for a galaxy of adventure with this detailed and sculpted six-piece figure play set featuring characters from Solo: A Star Wars Story. 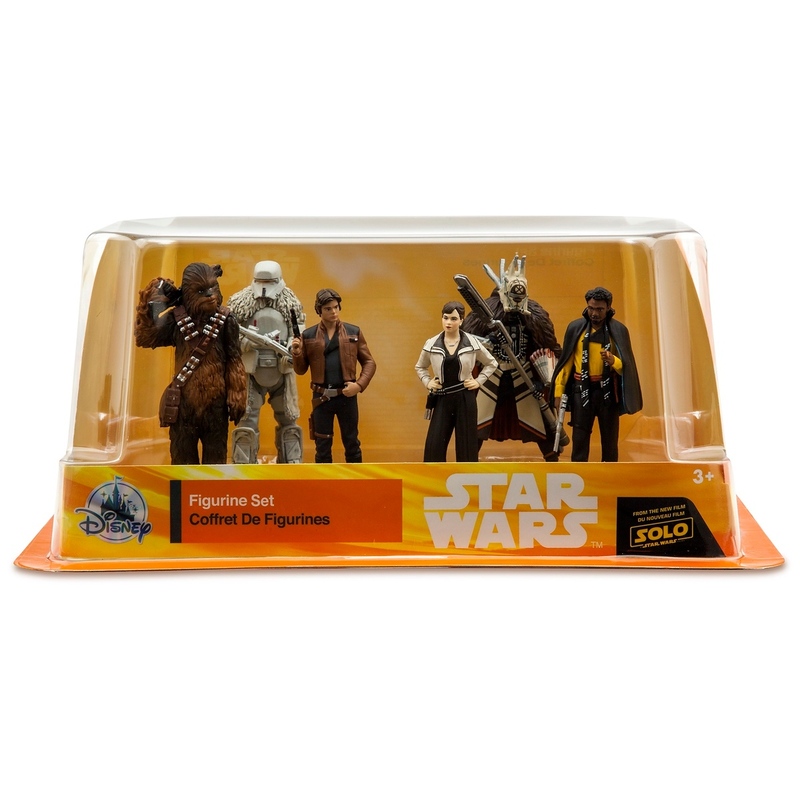 Set includes: Han Solo, Chewbacca, Qi’ra, Lando Calrissian, Enfys Nest, and Range Trooper. Available only at Disney Store and shopDisney.com. Take your STAR WARS collection to the next level with these incredibly detailed figures. These premium 6-inch scale figures are designed with extensive detail and articulation for the ultimate collector. Characters include Han Solo, Lando Calrissian, Rey, DJ, and more. Each figure sold separately. Pick a side in the galactic battle between good and evil! Choose between LANDO CALRISSIAN and KESSEL GUARD from SOLO: A STAR WARS STORY and more. Each 3.75-INCH DELUXE FIGURE 2-PACK comes with at least 2 figures and multiple accessories. Activate an array of sounds and phrases specific to each character with FORCE LINK 2.0 wearable technology. FORCE LINK wearable technology is compatible with all products in the FORCE LINK line, each sold separately. Iconic STAR WARS characters are spinning heads around the galaxy with the STAR WARS MIGHTY MUGGS Figures. Solo: A Star Wars Story figures include Lando Calrissian, Qi’ra, Stormtrooper, and Han Solo. Get ready for more over-sized STAR WARS adventures with these 12-INCH FIGURES! Each figure is crafted with five points of articulation and comes with its own accessory. Characters include HAN SOLO, QI’RA, IMPERIAL PATROL TROOPER, and more. Each figure sold separately. Make the KESSEL RUN in less than 12 parsecs with the MILLENNIUM FALCON! Relive the adventure and imagine flying through every obstacle like ace pilot HAN SOLO with speed and action. Fans will experience flashing lights and sounds as they pretend to race along KESSEL RUN. Press the button to pretend that the iconic starship kicks in to hyperdrive with lights and sounds. Press the button a second time for accelerated lights and sounds as well as activate the rumble pack vibrations! Push the button a third time to pretend that your ship picks up even more speed and watch the panels pop off before rumbling to the finish line! Comes with an exclusive 3.75-inch scale HAN SOLO figure and removable mini ship. Both the figure and mini ship are FORCE LINK 2.0 enabled, with phrases and sounds activated by the wearable technology, sold separately. Includes 1 vehicle (with removable mini ship) and 1 figure. Requires 3 AA batteries, included. Soar through the galaxy with the 3.75-inch scale HAN SOLO’S LANDSPEEDER and HAN SOLO figure, and more. All vehicles and figures are FORCE LINK 2.0 enabled, with phrases and sounds activated by the wearable technology, sold separately. Includes 1 vehicle and 1 figure. Each sold separately. Based on classic MONOPOLY gameplay with an intergalactic twist, players can move across the STAR WARS themed gameboard to uncover memorable moments throughout HAN SOLO’S life. Featuring graphics of the beloved character from the iconic STAR WARS series, the MONOPOLY: HAN SOLO Edition Game will have fans across the galaxy racing to “own it all!” The STAR WARS MONOPOLY: HAN SOLO Edition Game includes 1 gameboard, 4 Tokens, 28 Title cards, 16 Chance cards, 16 Community Chest cards, 32 Houses, 12 Hotels, 2 Dice, 1 Money Pack, and one game guide. Bring STAR WARS adventures to life with the newly designed FORCE LINK 2.0 STARTER SET including FORCE LINK wearable technology, which allows fans to activate movie sound effects and phrases in more than 30 compatible STAR WARS toys! Use the Force with an exclusive 3.75-inch HAN SOLO figure only available in the FORCE LINK 2.0 STARTER SET, featuring unique sounds and expressions from SOLO: A STAR WARS STORY. FORCE LINK technology unlocks an extensive collection of sounds and phrases with compatible figures, accessories, vehicles, and playsets. Includes FORCE LINK wearable technology and exclusive 3.75-inch figure. Compatible with all products in the FORCE LINK line, each sold separately. Requires 3 AAA batteries, not included. Young Jedi can imagine taking on the galaxy with their very own Wookiee sidekick! The Furreal Ultimate Co-Pilot Chewie stands 16 inches tall and features more than 100 sound and motion combinations. With signature Wookiee-talk back interaction, the Ultimate Co-Pilot Chewie responds to external movements and sounds. Make a noise and the Ultimate Co-Pilot Chewie will roar back! Fans can enjoy everything from naptime to pretending to fly with their Wookiee sidekick. The Ultimate Co-Pilot Chewie features poseable arms and can respond with a variety of facial expressions for fun surprises. Includes iconic bandolier and satchel. Requires 4 AA batteries, not included. Available Fall 2018. Collect the galaxy of fan-favorite characters with the STAR WARS MICRO FORCE Blind Bags Assortment. Each figure has a squishable feel and pose, creating an exciting new way to bring iconic STAR WARS scenes to life! These stylized, movie-inspired micro collectibles include iconic characters such as REY, FINN, DARTH VADER, LUKE SKYWALKER, PRINCESS LEIA ORGANA, HAN SOLO, CHEWBACCA, YODA, R2-D2, and more. Each blind bag includes two figures and a collector card. Each sold separately. Create the wildest Wookiee hairstyles in the galaxy! Grow PLAY-DOH hair for Chewbacca by filling him up with PLAY-DOH compound and pressing down on his arms. Once his hair has gotten too long, grab the BB-8 scissors and chop it all off to start all over again! Use the bowcaster comb for more creative customization, and make other Star Wars shapes with the half-molds around the playset. Jakks’ amazing BIG FIG figures stand a whopping 18-20” tall and include: An incredible level of detail, Seven points of articulation for fully poseable action, A blaster accessory and fabric cloaks. Enforce the Galactic Empire’s will with this Imperial Patrol Battle Pack. Help the Recruitment Officer sign up new soldiers to strengthen the Imperial Army. Work with the Emigration Officer to banish unwanted citizens with the help of the Patrol Troopers and their speeder. With this imposing battle pack, order WILL be restored to the galaxy! 99 pieces. Travel with Han Solo and Qi’ra in Han’s super-fast Landspeeder. Open the hood and use the wrench to check the engine. Open the rear compartment to hide the secret cargo. Unload the ammo and rearm the blasters. Then jump into the speeder and zoom off on exciting adventures. 345 pieces. Recreate action-filled scenes from Solo: A Star Wars Story with this LEGO® Star Wars Moloch’s Landspeeder set. The vehicle features an open minifigure cockpit, storage hold at the rear and hidden wheels for a cool hover effect. This Star Wars toy also has a 6-stud rapid shooter for intense action play, and 2 Corellian Hound figures to add an extra dimension of battling fun for any LEGO Star Wars fan! 464 pieces. Help Han Solo and Tobias Beckett evade the Imperial TIE Fighter! Can you make it past the Stormtrooper and escape before the TIE Fighter pilot fires the powerful shooters? You decide! 519 pieces. Hot Wheels® is taking the characters from the highly anticipated Solo: A Star Wars Story film to new proportions with Battle Rollers . These unique scaled down die-cast vehicles place the character in the pilot’s seat, as they speed, drift, and race through the galaxy propelled by extraordinary ball bearing action. Battle Rollers inspired by the Star Wars galaxy fire up kids’ storytelling and imagination for endless battles and re-enactments inspired by the new film. Two iconic brands in adventure — Hot Wheels® and Star Wars — have formed an awesome alliance! Kids and collectors alike will love seeing their favorite characters from the highly anticipated film, Solo: A Star Wars Story reimagined as Hot Wheels® cars. Each 1:64-scale vehicle is individually designed to accurately reflect recognizable characters from the Star Wars universe, combined with the thrill of Hot Wheels® racing excitement. In a story that spans the decades, from a time before Han and Lando ever met, to a time after the destruction of the Empire, Star Wars: Last Shot features the two biggest scoundrels in the New Republic on their most dangerous adventure yet. Available April 17. Jump inside the Millennium Falcon and help Han and Chewie as they journey across the galaxy on a simple smuggling job. But nothing is ever simple with Han Solo, and when things go wrong, Han pretends to be Jabba the Hutt to save himself, Chewie, and the Millennium Falcon. And that’s when things go from bad to worse! With over twenty possible outcomes, readers will have to think like a true smuggler to keep Han and Chewie safe from Imperial TIE fighters, Mandalorian mercenaries, and so much more! With so many different story paths, the adventures never end! Available April 17. 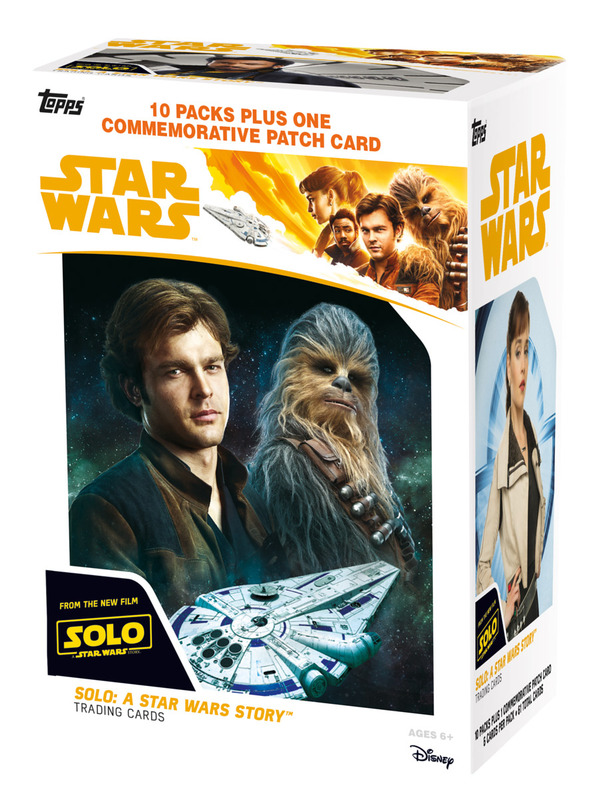 Trading cards featuring characters, scenes, vehicles, artwork and more from the new film Solo: A Star Wars Story! Look for autographs from the cast, original sketch cards and manufactured patch cards. Hobby boxes guarantee two hits per box! Available May 25. New official photographs available featuring characters and scenes from the new film Solo: A Star Wars Story! Available in 8×10, 11×14 and 16×10 sizes with optional framing exclusively from Star Wars Authentics. Available April 20. Solo: A Star Wars Story arrives May 25. This entry was posted by Star Wars in Black Series, Books, Books + Comics, Chewbacca (Star Wars) | Characters | 4f7a5c94cb6c2d69de13c002, Chewbacca Noodle Rolls, Collecting, creatures, Daniel José Older, Disney Parks, Events, Ewok Hunt, excerpt, Games + Apps, GIFs, Han Solo (Star Wars), Hasbro, highlights, Interviews, Lando Calrissian (Star Wars) | Characters | 4f7a5c9dbac94d69de13c002, Last Shot, Merchandise, Millennium Falcon, National Pet Day, Night on Endor, poll, Polls, Quizzes + Polls, recipe, Recipes, RunDisney, runDisney Star Wars, Solo: A Star Wars Story, Star Wars Books, star wars games, star wars recipes, star wars toys, Star Wars: Battlefront II, Star Wars: The Black Series, Toys, trailer.